This was how Gata Luna looked when I first saw her at the dock. 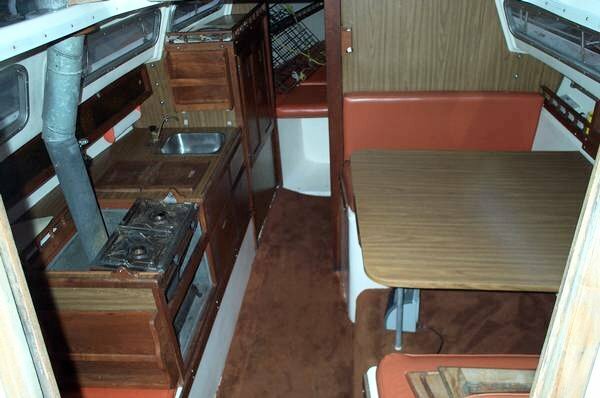 I had done my research and I knew I wanted a Catalina 27 with an outboard motor and the dinette layout with forward galley and two quarter berths. I'd not looked at very many and the ones I saw either had the wrong layout or were trashed. They say you don't choose your boat, your boat chooses you. When I first went aboard this boat, I knew she was the one. I sat at the dinette and envisioned sharing a meal with friends around this table anchored somewhere in the San Juan Islands. I envisioned the learning I would have to go through to properly fix, maintain, navigate, sail, dock, and anchor a boat like this. And suddenly I couldn't believe I'd been without a boat all these years in Seattle. I have a degree in oceanography and worked for several years as an oceanographer. I've spent plenty of time at sea. But I'd never before wanted a boat. Once I saw this boat, she was all I could think about. This was the layout I was looking for but there was some work to do. The carpet was brown and smelled of mildew. The cushions were orange, vinyl, and also smelled. Faux wood was apparently the rage in boats in 1973. I prefer real wood myself. All the teak had been oiled a few times then ignored for years. What's that pipe behind the alcohol burners? It's a pot-bellied wood burning stove. Yep, someone tore up the drawer space and installed a stove. The interior was stained dark from the smoke. What you don't see are the two large quarter berths under each side of the cockpit. The port side quarter berth is huge and is, perhaps the best berth I've seen on a boat. 8 feet long and 3 feet wide at the top. Cozy for two but luxurious for one. This is why I wanted this boat. 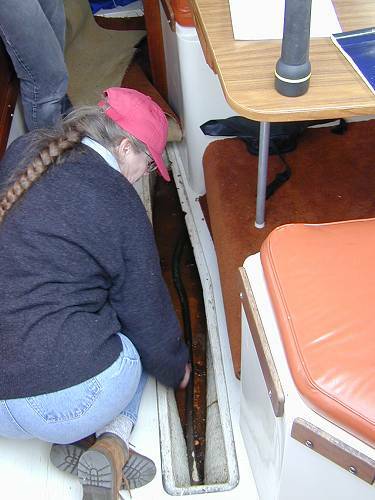 The bilge had an inch of water in it - mostly rain water leaking through windows, hatches and deck fittings. With no inboard, at least it was free of oil. My surveyor nearly fell over when as she tapped on the rusted out keel bolts with her inspection hammer, one broke off. I had to show her through the dingy water the shiny heads of 8 retro fitted lag bolts. Thankfully, there was no holding tank. I could only imagine the smell that would have come from it seeing the lack of maintenance in the rest of the boat. I'll probably upgrade to a Porta-pottie since I really hate head smell in a boat and mine has never had it. Here's a look from the front. She had roller furling and a nice 140% genoa. The mainsail looked new and had a nice cover. There was an anchor and rode and a crab pot in the v-berth. The running rigging definitely needed attention and the standing rigging looked original. The outboard was toast and the deck looked like it could use a paint job. On the haul out, we found a few minor blisters and the infamous Catalina Smile. She was an abandoned boat who needed some attention to get her back in good condition. But she was solid and had the potential to be a sweet little Puget Sound cruiser. We offered half the asking price then agreed on a figure a bit above it. I think we were the first serious offer the buyer had in a while and he took it. We saved money on the buying price. We would spend it later, but at least we would spend it on the things we wanted for the boat. And, we would take the time to do things right. 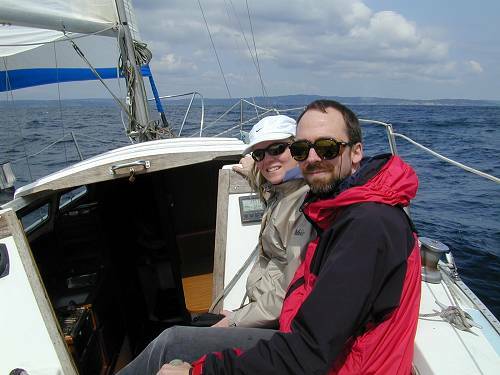 Here's my wife and I out on the test sail. This was the perfect first boat to discover if we liked boating. She would teach us how to sail, and how boats worked. Through working on her I would learn the secrets of varnish, woodworking, marine electronics, marine sanitation systems, rigging, high-tech polyurethane paint, epoxy and fiberglassing. If we enjoyed it, she would introduce us to a new phase of our lives. If not, she was an inexpensive experiment. We spent that first summer sailing as often as we could. We knew practically nothing and for a while just raising the main sail was an exciting experience. Docking was especially nerve wracking and I always had plenty of people forward to fend us off other boats in the marina. However, near the end of the summer, we had become more sure of ourselves. 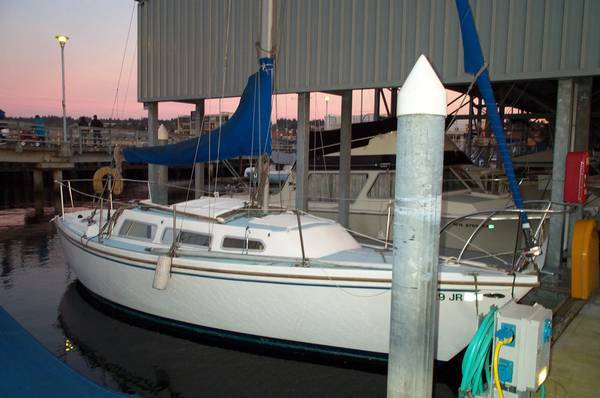 With my boat docked behind where I worked, I began to singlehand the boat around Lake Union in the evenings. When fall (and the rains) finally came, we had come to a conclusion. 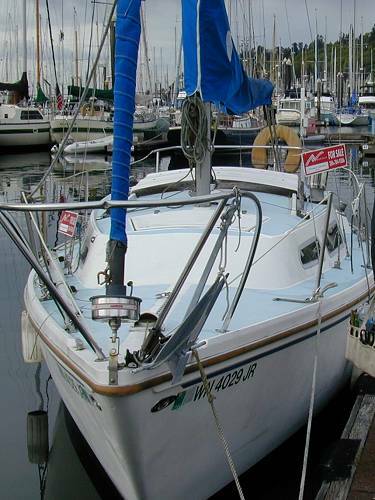 We loved boating and we loved our little Catalina 27. I would take the time to make her a real boat again and then we let her show us parts of our state we had never seen.